Dementia often affects the person’s ability to think abstractly. This means inferencing or “reading between the lines” becomes difficult. Hidden messages stay hidden and words are taken for their literal meaning. I struggle with this as well. 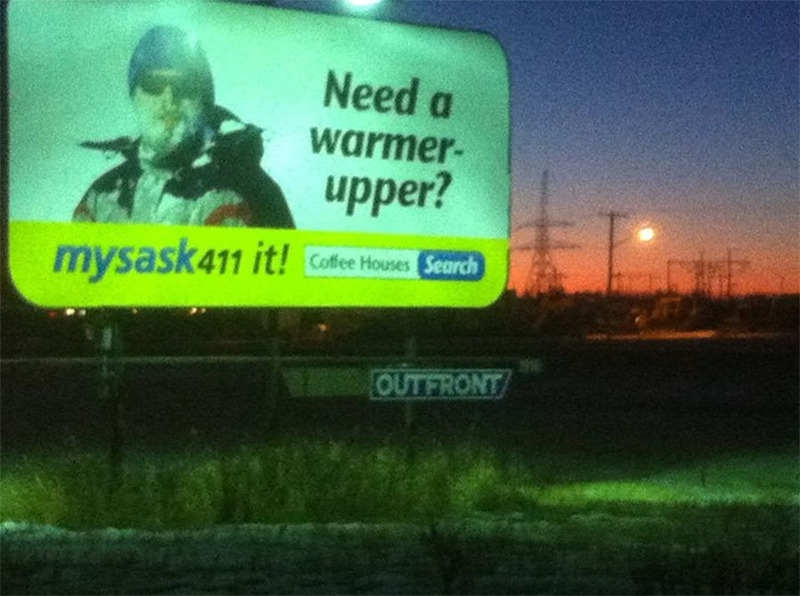 The other morning, while out walking with Sadie, I came across this billboard advertisement. Take a moment to look it over and get the general sense (it’s hard to see but his face and beard are covered in frost and snow). Now… if you were me, you would understand it to mean that he needed warmer uppers in the sense of warmer upper body clothing and then you would proceed to think of all the stores he should shop at and what items he should have. Then you see the “search” for coffeeshops and for a moment you are really confused. You continue to look it over and start reading the message differently putting the words “warmer-upper” together and presto you now get it!!! This has yet to cause any harm but can be tricky in conversations as it really slows me down. Meanwhile everyone else has carried on with the conversation. It also affects my reading whether it be text messages, Skype or a novel. Inferencing is a skill that teachers pass on to their students at a young age… parents, teachers please keep it up! Truthful Kindness: Excellent observations, Lori. Would you like to make it public? In fact, could take these 2 updates & put on blog page for you. That would enable them to go in the newsletter at end of week. ((grin emoticon)) Let me know. Today was the Alzheimer Society’s Walk for Memories. I participated with the hopes of educating others about the illness, especially Young Onset. First, I was not allowed to bring my dog, Sadie. Part of me can understand why she was not permitted since the walk took place on the track in the Field House but the other part of me does not understand the inability to make exceptions. I was hoping other people would benefit from meeting her and understanding the impact of having a trained companion dog or guide dog (if you are fortunate enough). The walk was kicked off with some speakers including our Mayor, MLA and reps from the ALZ Society. We all wore bibs that identified who we were walking for. My bib said “Myself – Young Onset Dementia”. People were encouraged to talk to each other and share stories. Much to my chagrin, clicks were soon formed and that was how the walk progressed. Neither the Mayor nor the MLA made contact with more than one or two people they obviously knew. One person said Hello to me…clearly she knew me but I don’t remember her (common problem lately). There was a day where I could have joined a group and introduced myself. A person with dementia finds this more difficult. So what I thought was going to be an excellent opportunity to help others understand this illness from a young person’s perspective turned out to be a Sunday walk without my doggie frown emoticon Well, I will continue to post here and hope you will all pass the message. And, one person at a time, the stigma of this disease can be eradicated from our society.